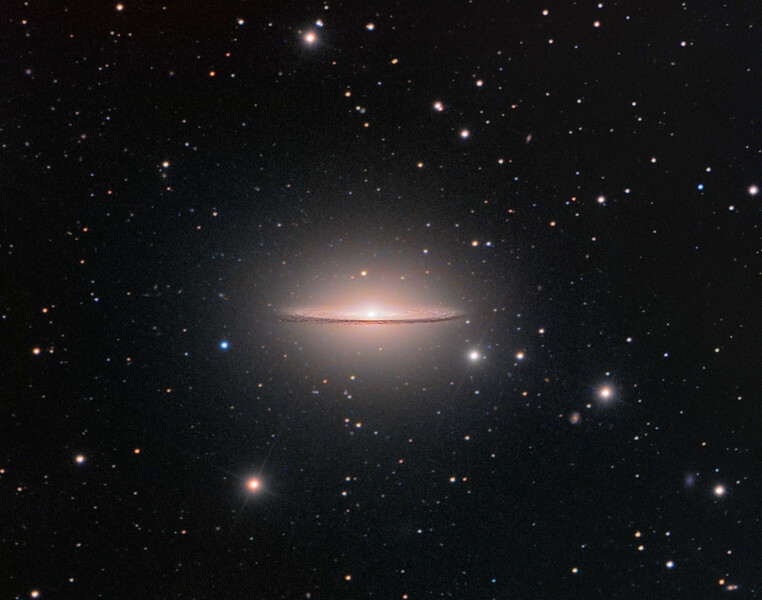 The Sombrero galaxy, or Messier 104, is a giant Sa type disk galaxy viewed from just above its equatorial plane and outlined by a prominent dark rim of obscuring dust. The central bulge is unusually bright and extended, and orbiting the galaxy is one of the largest known populations of globular clusters, containing up to 1900 members. In comparison our own Milky Way galaxy has only around 150-200 such clusters. Nearby prime examples of these are Omega Centauri, Messier 4 and NGC6752. Some of the Sombrero's globulars are very large and one is classified as a separate Ultra Compact Dwarf galaxy, SUCD1, the closest known example of such an object. It is not known how the Sombrero amassed such a large number of globular clusters. This is normally a more typical feature of large elliptical galaxies. For example up to 12,000 globular clusters are orbiting the giant elliptical galaxy Messier 87. The Sombrero Galaxy also contains a supermassive black hole of one billion solar masses - one of the most massive black holes among nearby galaxies. The galaxy lies some 30 million light years away in the direction of the constellation Virgo. What a wonderful photo; thanks for the background commentary!